The history the war's critics choose to ignore 10 years later. It was 1998, and Iraq and the U.S. were edging toward war. 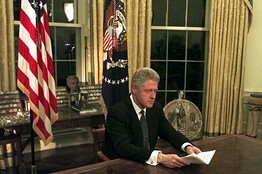 President Clinton addresses the nation about Iraq in Dec. 1998. The Iraqi dictator, President Clinton warned that February, "threatens the safety of his people, the stability of his region, and the security of all the rest of us. Some day, some way, I guarantee you, he'll use the arsenal." In October, the Iraq Liberation Act, which made regime change in Iraq official U.S. policy, passed 360-38 in the House and by unanimous consent in the Senate. In December, Mr. Clinton ordered Operation Desert Fox, a four-day bombardment of Iraq with the declared purpose of degrading Saddam's WMD capability. "Saddam Hussein has been engaged in the development of weapons of mass destruction technology which is a threat to countries in the region and he has made a mockery of the weapons inspection process," said Rep. Nancy Pelosi, justifying the case for military action on the eve of Mr. Clinton's impeachment. Whatever else might be said about the U.S. invasion of Iraq, which began 10 years ago, its origins, motives and justifications did not lie in the Administration of George W. Bush. On the contrary, when Mr. Bush came to office in January 2001 he inherited an Iraq that amounted to a simmering and endless crisis for the U.S.—one that Saddam appeared to be winning. American and British warplanes enforced a no-fly zone over northern and southern Iraq at a cost of $1 billion a year. The U.N.'s Oil for Food sanctions designed to "contain" Saddam were crumbling amid international opposition to its effects on the Iraqi people, even as the regime used the sanctions as a propaganda tool and as a vehicle to bribe foreign officials. Iraqi Kurds were in perpetual jeopardy, as Saddam demonstrated in 1996 when his Republican Guard took the city of Irbil and shot 700 Kurdish partisans. Most seriously, after 1998 Iraq rid itself of weapons inspectors, meaning there wasn't even a small check on Saddam's ambitions to rebuild a WMD capability he had already proved willing to use. When the weapons inspectors finally returned to Iraq in the run-up to the invasion, they found Saddam playing the same cat-and-mouse games that had defeated them in the 1990s. "No confidence can arise that proscribed programs or items have been eliminated," chief U.N. weapons inspector (and avowed war opponent) Hans Blix reported to the Security Council in January 2003, adding that "the Iraqi regime had allegedly misplaced 1,000 tons of VX nerve agent—one of the most toxic ever developed." It was on these bases, and in the wake of the deadly 9/11 attacks, that Mr. Bush ordered the invasion. If he had lied about the intelligence—as was so widely alleged after the failure to find WMD—then so had Mr. Clinton in 1998, and so had the intelligence services of every Western intelligence service, including those of countries like Germany that opposed the war. Similarly, if Mr. Bush is to be blamed for going to war "illegally" because the U.S. failed to obtain explicit Security Council authorization, then so must Mr. Clinton for going to war with Serbia over Kosovo without U.N. blessing. So much for the usual canards about the war. As for the failure to find WMD, what the postwar Iraq Survey Group concluded was that Saddam had the intention of restarting his weapons programs as soon as sanctions were lifted. "It was reasonable to conclude that Iraq posed an imminent threat," David Kay, the ISG's first head, testified to Congress in January 2004. "What we learned during the inspection made Iraq a more dangerous place, potentially, than, in fact, we thought it was even before the war." The larger intelligence (and military) failure was not anticipating the kind of war the U.S. would wind up waging in Iraq. General Tommy Franks planned a conventional military thrust to Baghdad while Saddam was laying the groundwork for the insurgency that would follow. The result was that U.S. commanders thought the war was effectively finished before it had really begun. That mistake was compounded by General John Abizaid's "light footprint" strategy, which effectively ceded cities such as Fallujah to the insurgents while U.S. forces stayed on secure bases or conducted search-and-destroy operations. By the time Mr. Bush finally ordered Fallujah taken, late in 2004, the insurgency was full-blown and increasingly difficult to contain. Those weren't Mr. Bush's only mistakes. He agreed to Paul Bremer's over-long regency in Iraq. He allowed Colin Powell to try diplomacy with Syria even as Bashar Assad was turning Damascus into a safe haven for Saddam loyalists and a transit center for al Qaeda jihadists. He did little to stop Iran from supplying both Shiite and Sunni insurgents with armor-busting munitions that killed hundreds of U.S. soldiers. He deferred for too long to mediocre commanders who thought it wasn't their business to defeat an insurgency they believed could only be solved through political means. Above all, the Administration proved amazingly inept at rebutting its critics, particularly the politicians and pundits (you know who you are) who supported the war when it was popular and opposed it when it was not. Joe Wilson was proved a liar by a bipartisan Senate report, yet the myth persists that President Bush misled the public in his 2003 State of the Union address by claiming that Iraq had sought uranium in Africa, largely because Administration officials needlessly conceded a point on which they were right. The Administration also offered shifting rationales for the war. It stressed the WMD threat when it was trying to make a legal case at the U.N., and it later emphasized the importance of bringing democracy to the Middle East. Yet the central goal for the war—the one that topped an eight-point list in an internal White House memo from October 2002—was to create an Iraq that "does not threaten its neighbors." Had the Bush Administration stressed that the most dangerous weapon of mass destruction in Iraq was Saddam and his family, it would have run into less political trouble on the WMD claims. These failures were all the more tragic because they obscured much of what the war achieved. Today Iraq threatens none of its neighbors; it's a measure of the completeness of the transformation that we take this for granted. The war convinced Moammar Gadhafi to acknowledge and abandon his nuclear weapons program, making his eventual overthrow possible, and it even briefly succeeded in halting the Iranian nuclear program, something subsequent diplomatic efforts have failed to do. Iraq's people are no longer under constant threat of imprisonment, torture and murder; Kurds, Shiites and Marsh Arabs are not at risk of genocide. And while Iraqi Prime Minister Nouri al-Maliki has an authoritarian streak, he is neither a sociopath nor a fanatic, which makes for a favorable comparison with many of his neighbors. Despite partisan attacks that the war in Iraq was somehow a diversion from the real war on terror in Afghanistan, that's not how Osama bin Laden saw it. The war in Iraq, he said in December 2004, is "the most important and serious issue today for the whole world"; victory there, Ayman al Zawahiri said the following year, was the necessary condition for establishing a caliphate. What happened instead, thanks to the combination of the U.S. surge and the Sunni Awakening, was that al Qaeda was defeated militarily and rejected politically. That's more than can be said about the Taliban today. All this was achieved by the time Mr. Bush left office: Unlike President Clinton, he bequeathed his successor an opportunity instead of a crisis. President Obama could have capitalized strategically on that by negotiating a status of forces agreement that anchored the U.S. relationship to Iraq and provided a U.S. military bulwark against Iran. Instead, Mr. Obama chose to capitalize politically with a full withdrawal that appealed to his left base and furnished him with a campaign slogan. The result is an Iraq that is looking out for its own interests, with little concern for how they square with America's. Don't be surprised if someday Iraq is remembered as the war George Bush won and the peace Barack Obama lost. Today's conventional wisdom is that the Iraq war was an unmitigated fiasco that squandered American lives and treasure for the sake of a goal that wasn't worth the price. It's certainly true the Iraq war is a cautionary tale about the difficulty democracies have in sustaining lengthy military campaigns for any goal short of national survival. What's also true, however, is that the war came about because the crisis of Iraq was allowed to fester for a decade, because Saddam was a real menace, and because a world in which he had been allowed to survive would have been far worse for America and the region. The men and women who fought and died removed a grave threat to the Middle East and to America. As long as the U.S. remains a great power, it will eventually have to fight such a war again. When that day comes, let's hope our political and military leaders will have learned the right lessons from this bitter but necessary war.